This week Luxe Models wants to take the time to pay tribute to the life, times, controversies, jokes and fashion of the late Joan Rivers. There are few people who are just out and out unafraid to say what is on their minds, and who use that honesty to make their mark on popular culture and break down barriers. 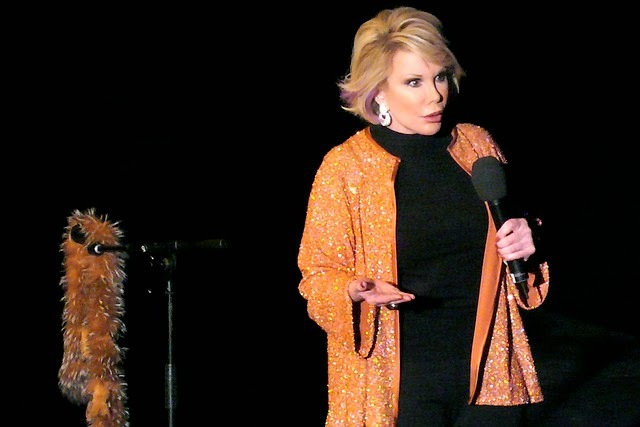 Iconic (and controversial) comedienne Joan Rivers was one of those people. Which is why it was so unfortunate that Joan Rivers passed away last night at the age of 81. Celebrities from Kathy Griffin to Jimmy Fallon to Ellen DeGeneres have paid tribute to the legend that was the funny woman, and now it’s Luxe Models turn. Joan Rivers was simply outstanding. Born to humble beginnings in New York in 1933, it didn’t take long for Rivers - who originally wanted to be an actress - to find her knack for comedy, playing any gig she could get in the 50’s and early 60’s, before she hit the big time with her appearance on the Tonight Show with legendary comedic forebear Johnny Carson in 1965. From there, her career went into the stratosphere, as she became a staple on US and UK telly in the 60’s, 70’s and 80’s. Yet her career was known for its many lows, and after appearing on the Tonight Show for a number of years, she launched a new rival show, The Late Show, on then-emerging network Fox in 1986. It tanked, and long-time friend Carson never spoke to her again. Yet, like the idol she was, she picked herself up by her boot straps, dusted herself off and got back in the game, fronting successful shows such as In Bed with Joan, bringing her unique brand of outrageous humour to a whole new audience. But it is for her career in the world of fashion that Luxe Models will most remember Joan Rivers. Don’t get us wrong, she was certainly no designer, but she was one of the best fashion commentators there’s ever been. Back in the 90’s, the funny woman fronted E!’s red carpet coverage, and she never shied away from a chance to tell an A-Lister just how hideous their posh frock is! Furthermore, she is known for recently co-hosting E!’s celebrity fashion show, Fashion Police, where she brought her biting critique of celeb wardrobe mishaps to a whole new generation. So we at Luxe Models salute you Joan Rivers, you were truly one of a kind. Anybody who was honest enough to tell a celebrity that their outfit just plain sucked to their face is someone this world will sorely miss! For more info and stories like this, be sure to stay in touch with Luxe Models on Facebook.